CHINESE: Liu xue tong, Zhang peng shu, Lu tong. INDONESIAN: Tutup ancur, Mara, Mapu. MALAYSIA: Kundoh, Mahang puteh, Tampu. PAPUA NEW GUINEA: Tabi, Tabu. THAI: Hu chang tek, Lo khao, Mek. 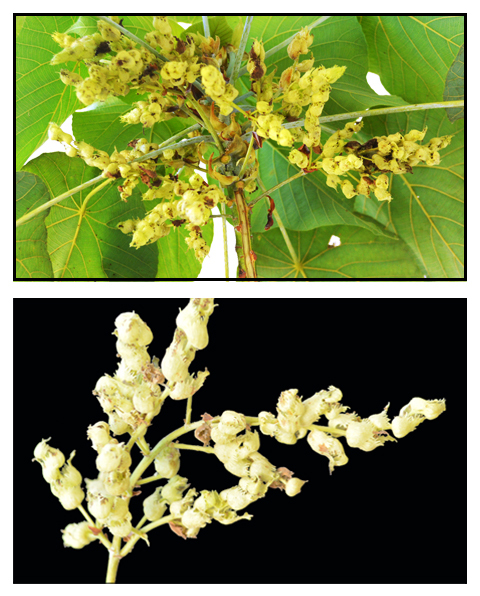 Binuñga is a small, dioecious tree, growing to a height of 4 to 8 meters. Leaves are peltate, ovate to oblong-ovate, 10 to 25 centimeters long, with entire or toothed margins, with a rounded base and pointed apex. Male flowers are small and born on slender, branched peduncles which are shorter than the leaves. Female flowers are usually found in simple panicled spikes or racemes. Capsules are 10 to 12 millimeters in diameter, of 2 or 3 cocci, covered with pale, waxy glands and with soft, scattered, elongated spinelike processes. - In thickets and secondary forests, at low and medium altitudes throughout the Philippines. - Also found in the Andaman Islands and Malay Peninsula to southern China and Taiwan southward to northeastern Australia. 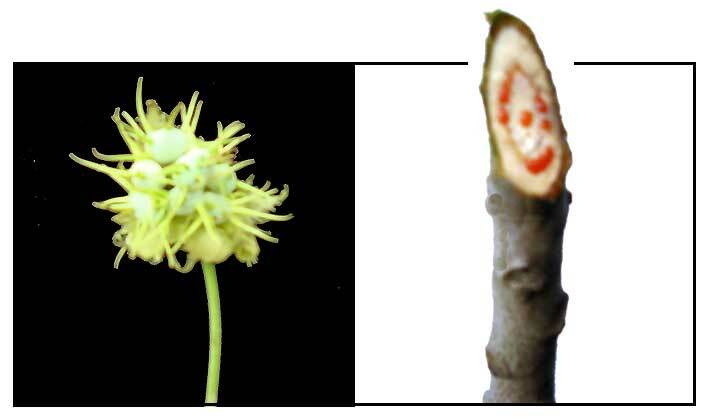 Flower (L), and cut branch exuding reddish sticky resin used as glue (R). • Phytochemical studies of leaves yielded three new constituents: tanarifuranonol, tanariflavanone, and tanariflavanone D with seven known compounds. • Bark yields a resin-glue. • Two new prenylflavanones, tanariflavanones A and B, and one known compound, (–)-nymphaeol-C were isolated from the fallen leaves. The flavonoids exhibited phytotoxic activity. • Stems yielded diterpene ketol, macarangonol, terpenoids and steroids. • Considered emetic, antidysenteric, antioxidant, antibacterial. · Powdered roots used as emetic; decoction for hemoptysis. · Decoction of bark and roots used for dysentery and hemoptysis. · Decoction of roots used for fever and to suppress coughing. · Decoction of sliced young leaves used for diarrhea. · Glue from stems applied to toothaches. · Glue from stems applied to aphthous stomatitis. 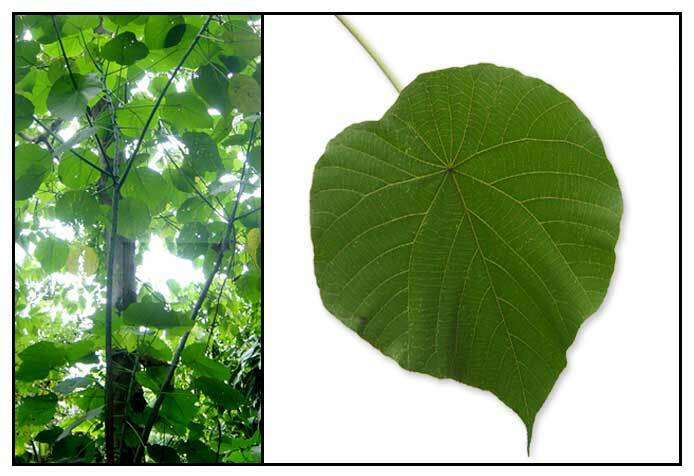 · Leaves used for wound healing and inflammation. · Bush medicine in Australia records the use of the sticky and waterproof latex as sutureless stitching for deep cuts. · In Thailand decoction of root is drunk as antipyretic and antitussive. Dried root used as emetic. Fresh leaves used to cover wounds as anti-inflammatory. · In Malaysia, used to treat diarrhea and dysentery. 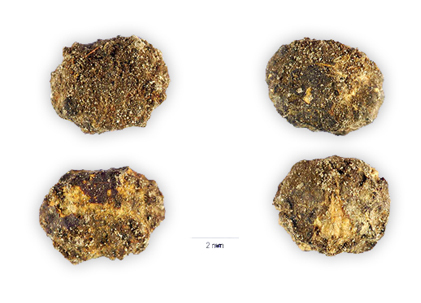 · In Indonesia, plant used to treat diarrhea, injuries, and inflammation. · Glue: Glue from the tree bark used for fastening parts of musical instruments. · Wood: Wood used as structural timber. · Basi: Bark and leaves used in making "basi," a fermented drink. · In Sumatra, bark material used to make containers. · Yields a high quality pulp and produces a high quality particle board. · Bark contains tannin used for toughening fishing nets.